Hiya! 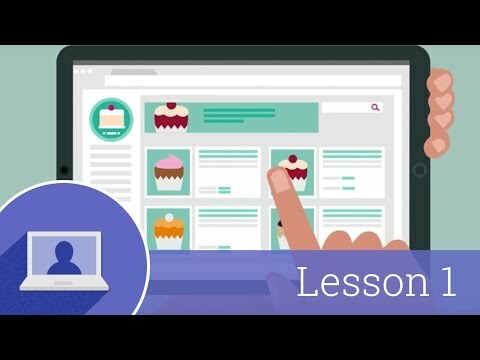 In this lesson, we’ll introduce you to all the ways you can create an online presence—from websites and social media to local business listings and review sites. You can see just how important it is these days to be online, so let’s get going. The most obvious way to “go digital” is with a website. Early websites weren’t much more than online brochures that described the who, what and where. Today’s websites can do much more. Your site can help people do research, chat with experts, read customer reviews, watch videos, buy things, track orders - and much, much more. If you decide that a website makes sense for you, the key is to think about what your site actually needs to do in order to support your business goals. We’ve got a whole lesson coming up where we’ll talk about that in detail, but for now, don’t worry about whatever today’s shiny new technology is if it’s not going to directly contribute to your goals. Of course, it’s also possible to do business online without a website. If you own a bakery for example, you want customers to be able to find you, website or not. Think about the last time you had a craving for a carrot cake. You probably searched for something like ‘bakery near me’ and reviewed your options. You might see a website for a local bakery...or you might discover a good option in local listings. Some businesses use local listings to create a digital presence, using products like Google My Business and Bing Places for Business. These types of directories let businesses publish details like descriptions, reviews, maps and images. These listings are usually free, and are a good way to help your business appear on results pages when people search. Beyond local listings, there may be review sites for your specific type of business where people can leave feedback—and you can respond. Rave reviews will give you the edge over the competition. You can also use social media as your digital presence. People all over the world use Facebook, Twitter and Google+ pages to complement—or in some cases replace—a website. Another way you can reach customers online is through their mobile. You’ve probably downloaded apps or games on your mobile phone. You can create and offer these apps to customers yourself. Apps can take advantage of a mobile device’s unique capabilities, like GPS, mapping and phone, to connect with customers. If a customer installs your app on her mobile, the next time she’s near your shop, the app might send her a special offer, thanks to GPS. Apps could even let her place an order right then, so when she comes in she can skip the queue, pick up her order and pay by tapping her mobile against the till. Mobile apps are often used as loyalty tools, to encourage existing, frequent customers to come back… and maybe get a free coffee with that carrot cake. So, to recap: whether you use a website, local business listings, social media, mobile apps, or all of the above, the trick is to decide what you want customers to do, then create a home that accomplishes those goals. Together, these things work as your digital storefront: your space to interact with customers online. We’ve got lessons covering all of these areas, but for the next little while we’ll be focusing on websites: you'll learn the basics like how websites work, how to pick and register a proper domain name, and how to make whatever you decide to do online as friendly as possible to your digital visitors AND support the goals of your business. And if you keep watching, we’ll cover all of this and more.